Can STUFFED ANIMALS stuff their faces? I walked past this store front promoting birthday parties many times. The design was clearly for a younger audience. People would linger as they walked by while children would squeal with delight. 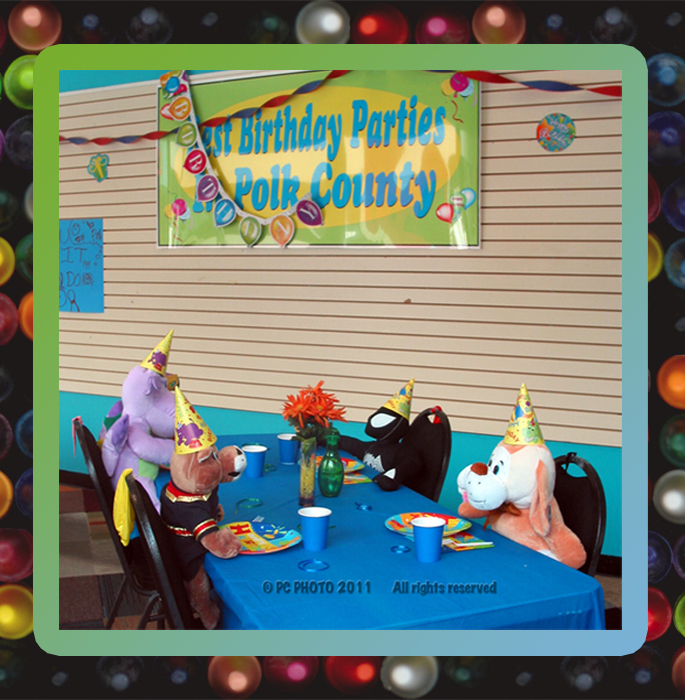 The sight of STUFFED ANIMALS sitting at a table wearing party hats in a room filled with Happy Birthday posters and colorful party decor were eye catching. Can you imagine how many children fantasized about attending such a fun party? Each time I passed by I thought I should get a picture. You know that little inner voice we so often ignore? Finally one day that nagging feeling tugged so hard I stopped and snapped through the window until I had something to share in my photo blog knowing it would bring a smile to even the most grumpy soul. Good thing I carry a camera where ever I. Double good I got the shot when I did. Today I passed by and the display was gone! So the question remains can STUFFED ANIMALS stuff their faces? Is that what happened and they all left the party stuffed??? I suppose only our imaginations can answer that question.